The first thing we did to decorate our baby's colorful and bright nursery was get the landlord's permission to paint the walls. As other apartment dwellers are aware painting is not always an option; it is simply not allowed. Fortunately, he didn't ask what color or else we probably would have been in trouble. We painted each wall with a different color. It was a very big room so it also houses our extra bed which is nice for cuddling our son, and visiting family. We wanted colors that would keep the room sunny as we live in a basement suite, and that would be stimulating and match everything. Everybody's first impression was shock. It is definitely an overwhelming paint scheme, but all of our son's toys fit in, even the tackiest, and he absolutely adores it. We tried to incorporate the four colors throughout the room. Go Here to See More colorful crib bedding sets for a baby's room that will create a bright spot in your home. We were on a very tight budget and honestly spent under $200 fixing this room up for our little one's arrival. We didn't buy any fancy bedding, just used some basic Sesame Street sheets. We wanted everything to be functional and replaceable. Baby's are known, after all, for the messes they can create. All of the furniture was second hand and some items like the change table (was a desk) had to been reworked. Luckily, baby's dad is a carpenter and has an incredible imagination. Our son loves his room, and it has become a great place for all of his little friends to get together and hang out in. If you have any questions about how we decorated our baby boy's nursery, post them here on Unique Baby Gear Ideas and I will be happy to respond. I love the bright colors for kids. And I am glad someone hasn't left you a mean comment about buying themed bedding like they did for my nursery, lol. So cute! I was thinking about doing mine all green but this is a way better concept I think cause it really adds character. We haven't found out whether ours is a girl or boy so it's nice to see something gender neutral that's still super fun. nice work! This is such a great room. I hope you win. It's really nice to see something that is gender neutral, will work as the kid grows up, and is functional. You are lucky to have enough space to keep the bed too. I love the painted coffee table with the little chairs, and the change table is brilliant, would never have guessed it was a desk. I hope you win this competition. It looks like a lot of love went into this room, especially given the budget you were working with. I'm sure your son will be just as creative as you and your hubby given all of the stimulating colors. Join in and write your own page! It's easy to do. How? 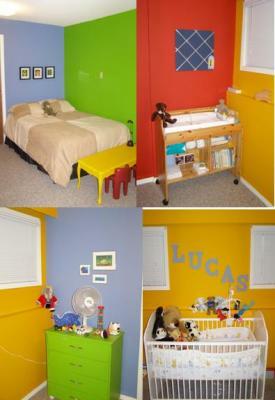 Simply click here to return to COLOR SCHEMES NURSERY PICTURES and DECORATING IDEAS.